As a journalist focusing on travel and, often beer, Evan Rail has been witness to some pretty amazing sights and experienced diverse flavors. His easy-flowing prose and sharp eye for important details have earned him many followers and have helped set a standard for beer journalism. 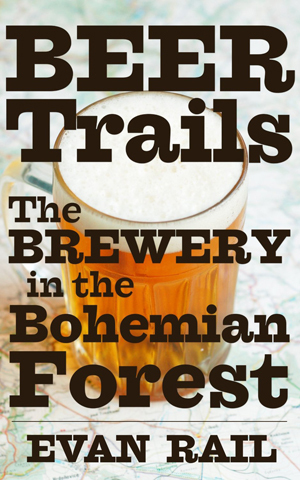 In Beer Trails: The Brewery in the Bohemian Forest, Rail goes deep into a once forgotten and then revived brewery in the Czech forest town of Kout na Šumavě. Part mystery mixed with history, the story also helps Rail answer two questions he is most frequently asked: What’s the best Czech brewery? And what’s Anthony Bourdain really like? Giving a look into his professional life, Rail talks about his personal discovery of the brewery and about the chef-turned-TV-star coming to the brewery with him to film a segment. The story (Amazon Digital Services Inc., Ebook, $2.99, 60 pp) has wit, charm and a bit of suspense, and is thoroughly engaging. It’s as if Rail himself is sitting at the end of a well-worn bar holding court over several pints. We eagerly await the next story.